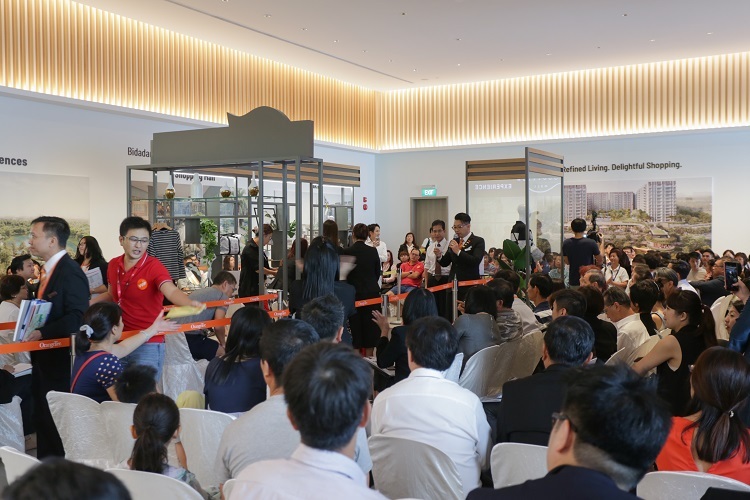 The launch of new projects in the Woodleigh-Potong Pasir neighbourhood in District 13 — notably, the 805-unit Park Colonial in July, 729- unit The Tre Ver in August and 667- unit The Woodleigh Residences on Nov 10 — is having a positive impact on the resale prices of some of the condominiums that were completed two to three years ago and located just one MRT stop away. Notably, at The Woodleigh Residences, the average price of units sold so far is $2,036 psf, based on caveats lodged. The Woodleigh Residences is an integrated development that includes The Woodleigh Mall, an underground air-conditioned bus interchange and the Woodleigh MRT station. It is a 99-year leasehold project jointly developed by Kajima Development and Singapore Press Holdings. The developer released 100 units for sale before closing its sales gallery from Nov 19 for an official launch sometime in 2019. Park Colonial, which is located adjacent to Woodleigh MRT station, has benefited the most. So far, the project is 69% sold, with the average price hovering in the $1,700-to- $1,750 psf range. Meanwhile, The Tre Ver is 32% sold, with the average price of transacted units hovering around $1,555 psf, based on caveats lodged so far. The latest launch usually pushes up the sales volume and transacted prices of earlier launches, especially if those projects are offered at a lower price, notes Ray Teo, associate branch district director at PropNex Realty.